Late last year, when people began sharing the quilts they had entered into Quiltcon, I noticed there were several quilts that used 3D blocks. I fell in love with all of them and decided to give 3D quilt design a try. After designing this quilt I submitted it to Modern Patchwork magazine and it was accepted for publication in the May/June 2017 issue, out now! 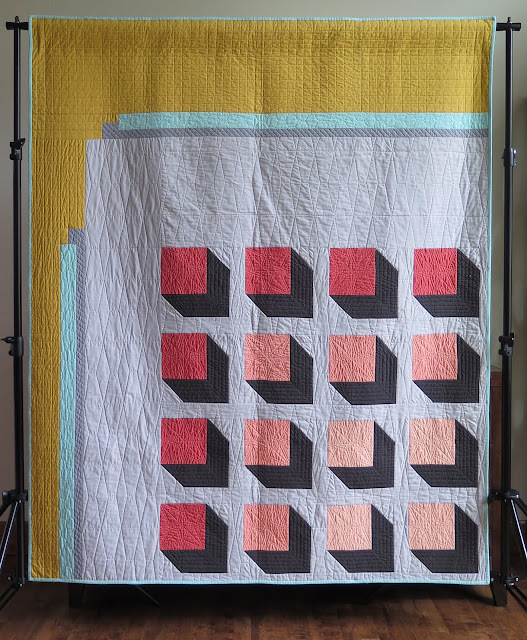 This is my second quilt pattern published in Modern Patchwork, which still blows me away. I've also had two rejections from Quiltcon magazine but it's all part of the process. 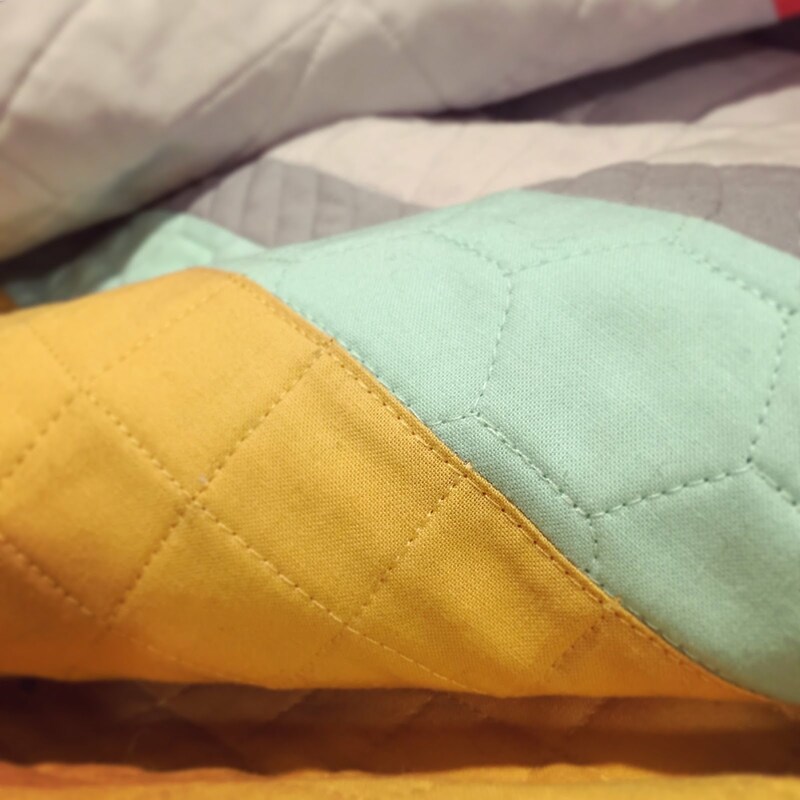 Most importantly I love making quilts and enjoy writing patterns so for now I'll keep plugging away at both. As I stated in the title of the post I was following a trend which is a great way to challenge yourself to break out of a design rut. I started with a simple 3D block that I placed in a grid. Then used an offset border in a unique way to add more depth. The end effect created the appearance of an aerial view of a downtown. When quilting this project I tried to use textures that were reminiscent to drawing aids, e.g. graph paper, rulers and a compass. I really like the overall effect of this design and it was fun to experiment with 3D block design as well as a new color palette. To wrap things up I'll give you a sneak peek at what I've been working on. This design is inspired by a Melody Miller print Roller Rink for Cotton and Steel and one of the first time I purchased the backing fabric for a quilt before I had designed it but this roller skate print was too great to pass up and and excuse to work with neon pink works for me! Hopefully I will have a finished quilt to show soon. It has been my intention to write a new post every two weeks, or so, this year and I think I had done a fairly good job at that until this post that ended up a little late because I was waiting to get my quilt back from the magazine. I'm thinking this roller skate design will get me back on track. This is lovely! Congrats on your feature! 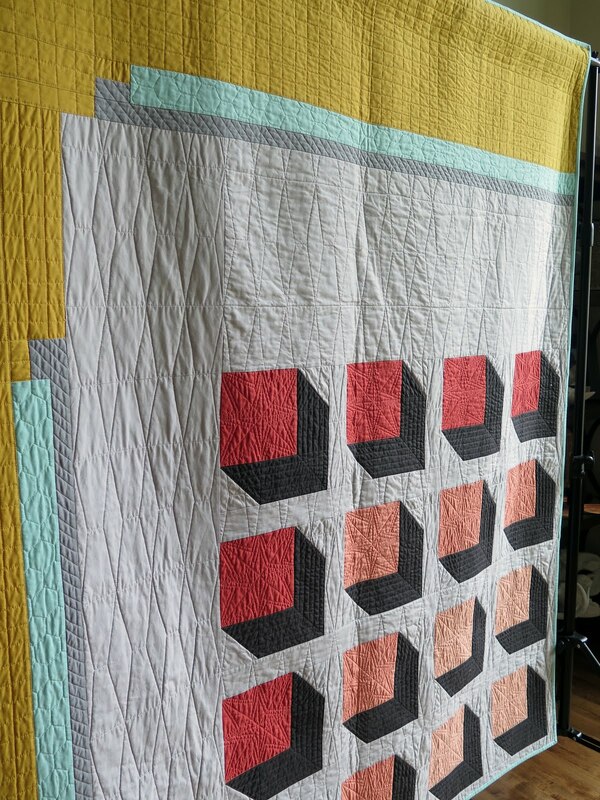 I hadn't really noticed the 3D quilt trend, so I'll be watching for it! Thanks Debbie! There weren't too many but they caught my attention, e.g. "Say Anything" by Lysa Flower, "Dimension" by Nydia Kehnle, "View Point" by Shruti Dandelar & "Wafting Diamond" by Lisa (sorry couldn't find a last name). Oh wow this is a gorgeous quilt! 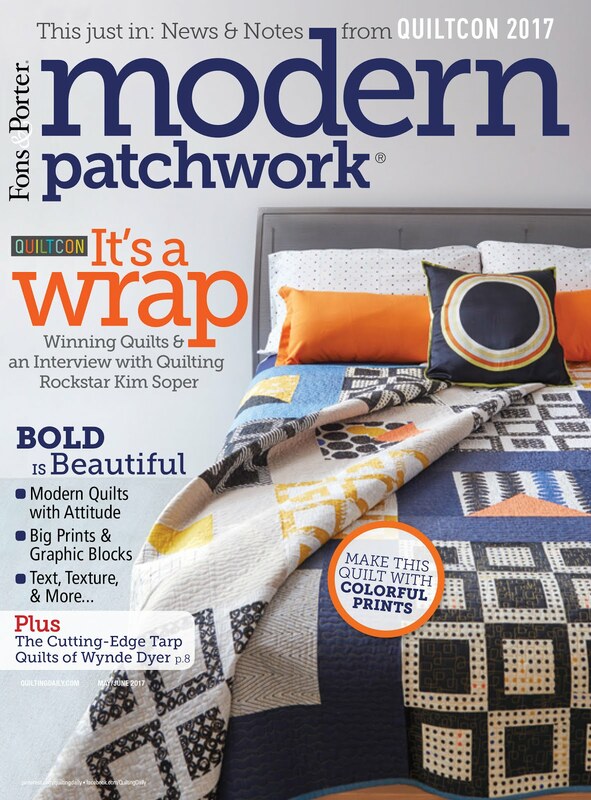 I'll need to look out for Modern Patchwork as I'd love this pattern! Thanks Kathryn! I hope you get a chance to make it. I think it could look great with prints too, maybe Carolyn Friedlander???? 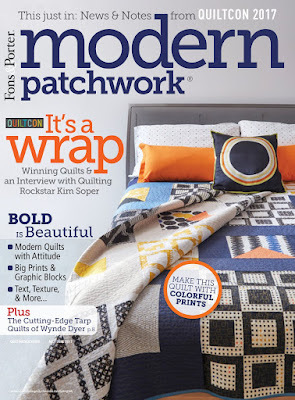 There's a link to the digital download of the current Modern Patchwork in my Patterns tab from Interweave.com if you can't find a hard copy. 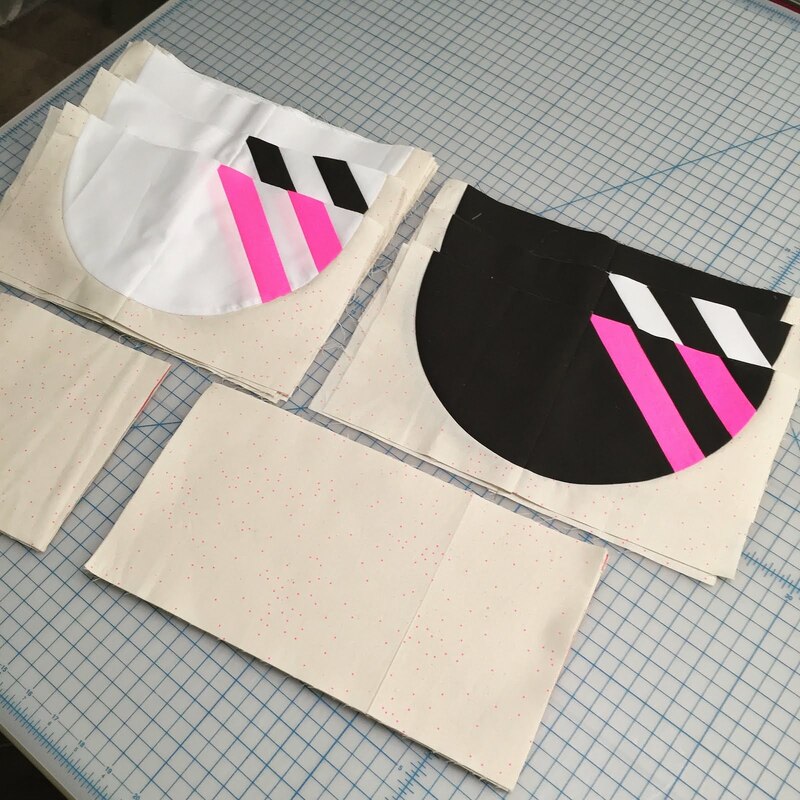 You can also post pictures of your work on IG using #cityplannerquilt and again thank you for your kind comments. 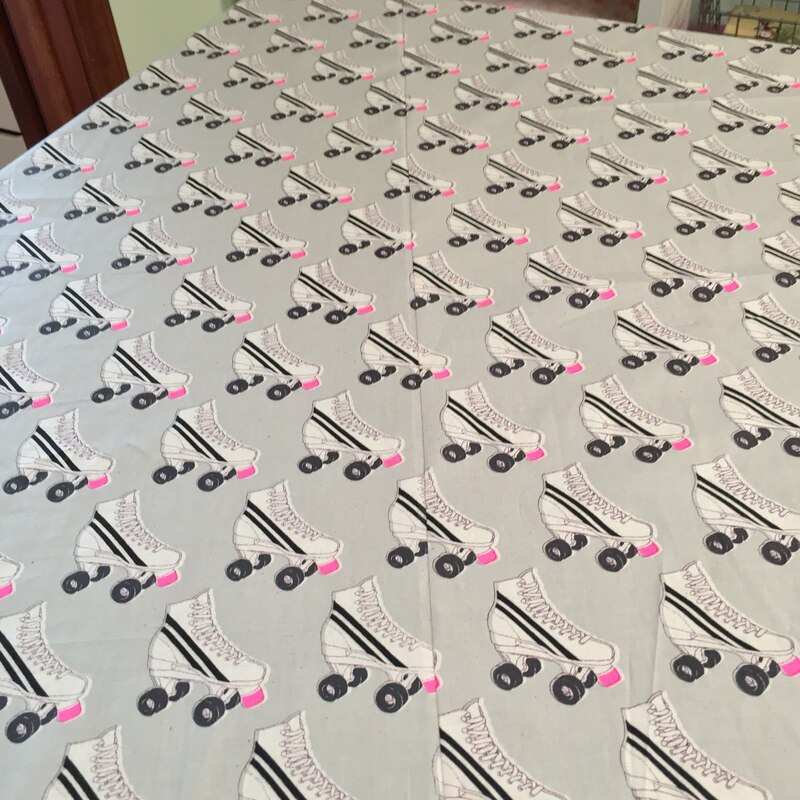 Heather, congrats on another publication and your individual patterns for sale. You know I am big fan of your work and so proud of your success. This is a great quilt and I love the colors. Thank you Robin! I really do like writing patterns and hope to get a couple more written this year, fingers crossed.